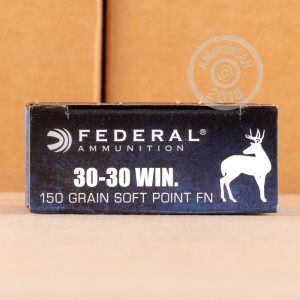 This Federal Power-Shok ammunition in .30-30 Winchester is a great way to get some hunting done without breaking the bank. 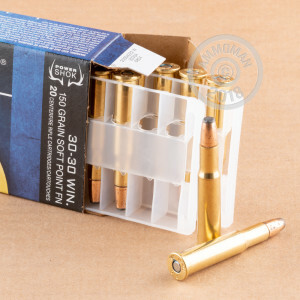 Each cartridge in this box of 20 fires a 150 grain soft point bullet ideal for taking down game quickly while preserving edible meat. A muzzle velocity of 2,390 feet per second produces relatively flat trajectories at medium range. Federal Power-Shok ammo uses non-corrosive Boxer primers and brass cases and is a favorite among many hunters due to its strong performance. Grab a few of these boxes (or any other items over $99) and get free shipping from AmmoMan.com!